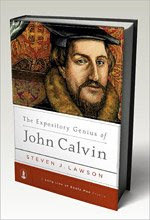 The Expository Genius of John Calvin by Steven J. Lawson, published by Reformation Trust (Lake Mary, FL: 2007), is part of Lawson's Long Line of Godly Men series. The main volumes are large works dealing with the Doctrines of Grace, one of which has been published so far (Volume One: Foundations of Grace). There are also smaller books looking at some particular aspect of a particular historical figure's life and/or ministry. There are two such books published so far, the one in question and also a book on Jonathan Edwards. This excellent little book is not another biography of John Calvin. Rather, it is study in homiletics, a text book for preachers, if you will. Dr. Lawson argues for our need of solid, biblical, expository preaching, and what such preaching should look like. It just so happens that John Calvin is a model example, and so this book examines the preaching of John Calvin. Lawson does provide us with a brief biographical look at John Calvin. Of all his many titles and accomplishments, Calvin was primarily a teacher. He is often remembered for his theological precision, his polemics, and his weighty text books, but Calvin thought of himself simply as a preacher who must feed the flock entrusted to him with the Word of God. And this he did, day in and day out, as well as training other men to do the same. To properly understand Calvin's sermons and preaching, we must first understand his foundations and presuppositions, which Steven Lawson lists as follows. First, Calvin's reliance upon the Bible as the sole authority in all matters. It is the preacher's duty to expound the Scripture, and to say nothing that is not within its pages. Secondly, God is present when His word is preached. Thirdly, preaching the pure Word is the main priority of the worship service. That is when God's people come to hear Him speak to them. Fourth, a verse-by-verse exposition of books of the Bible guarantees that the whole counsel of God will be preached. Calvin prepared for his sermons by diligently studying and learning of the Scriptures. He lived and breathed the Bible. He devoted himself to godliness because he did not think that a preacher should ask anything of his congregation that he does not demand of himself. Also, he had a relentless will to preach and pastor continuously, all for the glory of God. John Calvin began his sermons by diving directly into the text he was preaching from. No silly anecdotes preceded the word of God. He would briefly recap what had been previously preached to remind his listeners of the context of the whole argument of the author of the book he was preaching from. Calvin also delivered his sermons extemporaneously, without notes. This provided for a lively exposition rather than a dry reading of a manuscript, as was often done in those days. To make sure that his hearers knew what to expect, he would also start his sermon with a thesis statement for his sermon. It was Calvin's method to preach from a specific text. He didn't pick a topic and then choose some various verses that might support his thesis. He had the text before him first, and he preached from that, never straying from it. He was careful in using the historical-grammatical method of interpretation; that is, he wanted to discern what the author meant when he wrote the book to his audience. There is only one true interpretation of any given passage of Scripture, and that is what the author intended it to mean. In line with this, Calvin also interpreted the text in the literal sense in which it was written. In determining the meaning of difficult texts, Calvin knew that Scripture is its own interpreter. Thus, he would bring in other, clearer passages of Scripture to explain his text. But even his use of cross-references was sparing, so that he would not stray too far from his initial text. Calvin reasoned persuasively, contrasting truth with error and making use of similes, etc. He also made applications from reasonable inferences of the text, thought he strove to never speculate beyond what Scripture says itself. Although Calvin very strongly emphasized substance over style, he was nevertheless not without style in his preaching. Despite his incredible intelligence and knowledge Latin, French, and biblical Hebrew and Greek, he always preached in a simple, familiar language that could be easily understood by his audience. However, unlike many preachers today who attempt the same, he still used biblical language. Calvin would employ vivid expressions and ask thought-provoking questions to engage his listeners. He also would offer simple paraphrases of bible passages to explain them. “In other words, the apostle is saying...” as an example. Despite Calvin's being very well-read, he very rarely quoted outside authors. He did not want to obscure the Bible with the words of other men. Though Calvin gave no outline or clever alliteration in his sermons, his sermons still followed the logical flow of the text, with smooth transitions between points. Calvin was effective as a preacher because of his intensity of focus to the text of Scripture. Mere impartation of knowledge did not constitute a sermon in Calvin's opinion, so he also applied his sermons to the everyday lives of the people in Geneva. Calvin also preached to himself and always included himself in the applications. When exhorting the people to live the truth that was just preached or to examine themselves in light of the truth, he would say, “We must look at ourselves,” or “we must strive,” etc. He did not believe himself to be above the common man in the struggle for sanctification. Calvin also lovingly rebuked the sins that beset the people of that time and place, and he argued polemically against the major heresies of the day, particularly of Roman Catholicism. In concluding his sermon, Calvin would remind his listeners of the main points that he had provided and heartily appeal for them to be doers of the word. Finally, he offered prayer to God, bringing the congregation into the throne room of God and leaving them coram Deo. Steven Lawson's concludes the book by urging preachers today to return to biblical, expository preaching. He compares modern evangelicalism to white-washed tombs, in need of reform just as badly as the medieval church did. The only cure today is the same cure that was needed then, and that is expository preaching. I know that my summary of this book is rather long, but every point Lawson makes is an important one and there is nothing that I can really add. There are some thoughts that strike me and I will tell them now. First, as I said before, this is not a biography of Calvin. In fact, in a certain sense, this is not a book about Calvin at all. It could very well be a book on the principle of sola Scriptura as applied to preaching. “What?” saith you. “How can a book that focuses on a mere man from church history be about Scripture alone? That is contradictory.” Well, not really. That is why I urge you to read this book instead of just reading my summary. “Calvinists” are often accused of following a man, as opposed to following the Bible (though that accusation only works when our opponents are labeling us with a man's name and rejecting any label themselves, though they are just as guilty of following man-made traditions). One could look at the cover of this book, with John Calvin's name and picture on it, and assume that Steven J. Lawson is just some Calvin-follower, who is not so interested in what the Bible has to say. Such people need to read this book and they will quickly become disabused of such an idea. All of Calvin's preaching was aimed at taking peoples' focus off of the preacher and onto the glorious God being preached about. And this book functions in the same way. It points us to Calvin's preaching which itself points us to God and Christ as found in the Bible, and the Bible alone. With Calvin as his example, Lawson exhorts preachers to preach nothing but what is found in the Bible. They are not to waste time with extra-Biblical stories, philosophies, or speculations. If there is something that we wish to know but the Bible does not reveal, we are to not complain but to accept it, being content with what God does choose to reveal to us. A second thought of mine (and I guess this is where my endorsement of this book really comes in) is that I really wish preachers would read this book. Well, everybody should read it, but preachers especially. There is a real crisis in worship in our day, exemplified in one way by the fact that we tend to use the word “worship” to refer to that part of the service that is not the preaching. But what is more worshipful than to humbly and obediently listen to God speak to us in His word, and to have His words explained to us? What we have to give to Him is nothing compared to what He has to give to us. And we are not going to get what He provides from sermons that expound nothing more than the preacher's sentiments on what is popular at the time. It is only God's word expounded that we get that nourishment that we need. The pulpit is the throne on which the Word of God sits, and we need to honor it. This book presses home this importance in every sentence. One final thought, and that is about Steven Lawson himself. I have heard him preach a few times in person, and let me tell you, he practices what he writes about in this book. When he preaches, you really feel that you've been Preached at, with a capital “P”. It is not a lecture, a talk, a sharing, or a conversation. It is the words of God poured into and out from a heart set on fire for the zeal of God's glory. So read this book, then try to hear Steven Lawson preach in person, and you will know exactly what a sermon is supposed to be.